A recent bombshell report from the Associated Press says that, as a student at Yale in the 1980s, Kavanaugh was more interested in basketball than in taking part in the various political debates raging on campus. "I knew him more as a sports fan than a fan of any political agenda," said one law school friend. As a result, Kavanaugh was disinclined to "take sides" during a clerical and technical workers strike in 1984 that closed campus dining halls for weeks — suspicious behavior for someone who would go on to enter such a "judgmental" profession. Perhaps he should have pursued a career in the NBA instead? A number of Kavanaugh's friends at Yale described Supreme Court nominee as being humble and approachable, or "a normal guy, in a positive sense." He wasn't one of those Ivy League nerds who had ambitions of one day becoming president, or a senator. Nice try. You're not fooling anyone, nerd! A scathing New Yorker analysis of Kavanaugh's stint as a sports writer for the Yale Daily News contained a number of disturbing revelations. Among them was Kavanaugh's eerie critique of an officiating crew's performance during a basketball game against Dartmouth. For example, he audaciously suggested that the refs' refusal to call a number of obvious fouls allowed the game to "get completely out of control." Harvard Law professor Laurence Tribe rightly assessed Kavanaugh's diatribe as "a rare early condemnation of judicial restrain." If this troubling sports copy doesn't come up in Kavanaugh's confirmation hearing next week, Senate Democrats aren't doing their job. 4. He's a "carpool dad"
A recent Washington Post investigation revealed that Kavanaugh often spends his summers playing the role of "carpool dad," shuttling his children and their teammates to and from basketball games and other activities. Perfectly harmless? Think again. The alleged "conservative" judge appears to be taking his marching orders from the activist group Greenpeace, which lists "carpooling, cycling, or using public transit" as the number one way to reduce oil consumption and protect the so-called "environment." Many experts agree that carpooling is a gateway drug to perhaps the most obnoxious of all human endeavors, cycling. Running marathons is a close second or third, which is why Kavanaugh's reported affinity for racing long distances is a huge red flag that should probably derail his nomination, especially if he's one of those people with a "26.2" bumper sticker on his car. According to co-workers, Kavanaugh regularly holds the door open for other people at the office, even when they're absurdly far away. As a result, they are often forced to awkwardly speed-walk up to the door to avoid feeling rude, and also to reduce the amount of uncomfortable seconds with Kavanaugh just standing there, holding the door and smiling at them. Whereas normal, well-adjusted individuals rightly recognize Human Clay (1999) as the single most influential rock album of the 20th century, Kavanaugh insists that Stapp's first solo album, The Great Divide (2005), is both lyrically and musically superior, and has always considered Creed's lead guitarist, Mark Tremonti, overrated as both a player and composer. 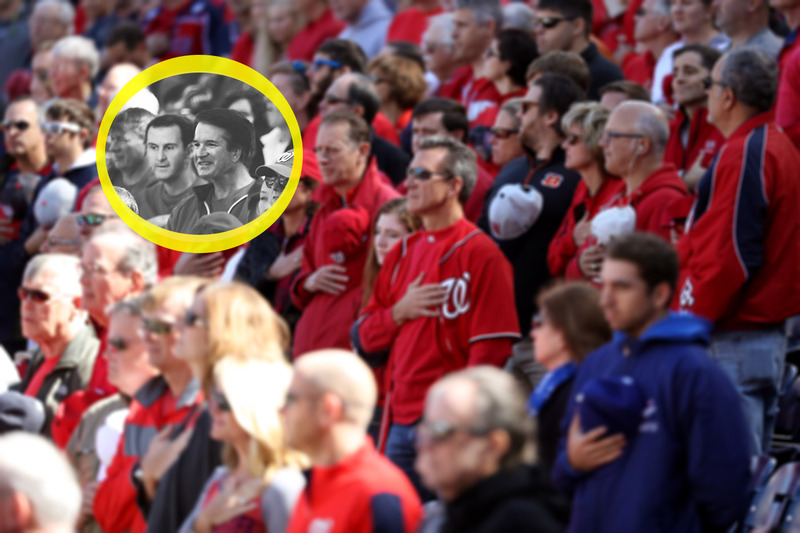 This one time, after a Washington Nationals game, Kavanaugh saw a stranger waving and calling out to him from a distance. Out of politeness, Kavanaugh waved backed and tried to initiate a kind of pantomime dialogue with the strange man through the crowd. He eventually realized the man was actually waving at his wife, who was standing about three feet away from Kavanaugh. He felt like an idiot, though, and hoped nobody noticed him making all those weird gestures to no one in particular. Kavanaugh has come under scrutiny for claiming to be a "fan" of the Washington Nationals. A recent Free Beacon investigation revealed that the judge has been attending games at Nationals Park with some rather unsavory company, including Syrian dictator Bashar al-Assad, Russian strongman Vladimir Putin, and a roided out Khalid Sheikh Mohammed, mastermind of the 9/11 terror attacks. Talk about a foul ball! 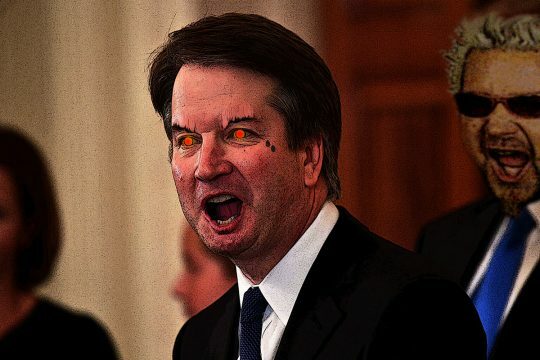 This entry was posted in Politics and tagged Brett Kavanaugh, Donald Trump, Parody, Satire, Supreme Court. Bookmark the permalink.